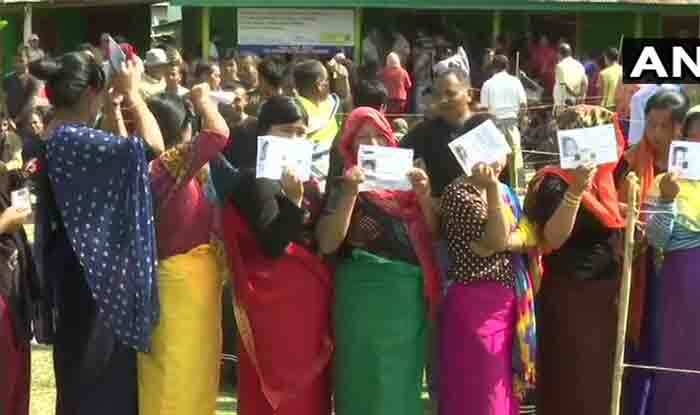 By 5 PM, Bihar had recorded a voter turnout of 50.26%. In Telangana, it was 60.57%, in Meghalaya 62%. New Delhi: Voting for the first phase of Lok Sabha elections was largely peaceful on Thursday. By 5 PM, Bihar had recorded a voter turnout of 50.26%. In Telangana, it was 60.57%, in Meghalaya 62%, Uttar Pradesh 59.77%, Manipur 78.20% and Lakshadweep 65.9% and Assam 68%. However, political parties have already started complaining about EVMs being rigged. The Bahujan Samaj Party (BSP) sent its complaint to the Election Commission (EC) that Dalits were prevented from casting their vote. It also said that the EVMs were rigged and there was even a video clip showing that even if one pressed the BSP button, the vote was going to the BJP. The EC said later, “There have been some incidents where EVMs have been damaged. Six incidents in Andhra Pradesh, five in Arunachal Pradesh, one each in Bihar and West Bengal and two in Manipur. Sporadic incidents of violence have been reported across Andhra Pradesh, Arunachal Pradesh and Uttar Pradesh. An IED blast by Naxals was reported from near a polling booth in Etapalli in Maharashtra’s Gadchiroli district. Two security personnel were injured. A TDP worker died in the clashes that erupted in Andhra Pradesh which is holding assembly polls simultaneously with the Lok Sabha elections. The first phase covered all the Lok Sabha constituencies in Andhra Pradesh (25), Telangana (17), Uttarakhand (5), eight seats of Uttar Pradesh, two seats each in Arunachal Pradesh, Jammu and Kashmir and Meghalaya and one seat each of Chhattisgarh, Manipur, Mizoram, Nagaland, Sikkim, Tripura, Andaman and Nicobar as well as Lakshadweep. Clashes between TMC-BJP cadres in Coochbehar’s Dinhata were also reported. BJP claimed that their party members were beaten up by TMC men. Meanwhile, the TMC claimed that their men were attacked by BJP cadres.